If you're suffering from farsightedness or nearsightedness, Acuvue Oasys 12 Pack Weekly disposable contact lenses could be the perfect choice. One of the top selling brands from Johnson& Johnson, Acuvue is acclaimed for introducing thefirst-of-its-kind soft disposable contact lenses in the world. A fine blend of advanced technologies, innovative design, and premium lens material, Acuvue Oasys 12 Pack Weekly disposable eyewear can keep your eyes comfortable throughout the entire day, even under harsh conditions and challenging environments where they would normallyfeel dry and tired. This is achieved by the smart use of next generation HydraClear Plus technology,which ensures optimum wettability. What's more, HydraClear technology makes your lens ultra-smooth, so you will never feel that you're wearing contact lenses. The high-quality silicone hydrogel material provides almost 98% of availableoxygen to your eyes, offering excellent breathability. Moreover, these contact lenses offer excellent UV protection, blocking almost 96%if UV-A and 99% of UV-B radiation from the sun. For easy handling and insertion, the lightly tinted blue and inside-out mark come handy. 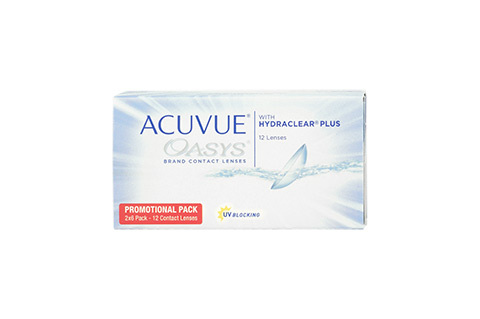 Acuvue Oasys 12 Pack Weekly disposable contact lenses is now available for sale at MisterSpex. With same day shipping, fast and trackable door delivery, and professional assistance, we ensure your online shopping for contact lenses is reliable, hassle-free, convenient, and exceptionalvalue.